This topic contains 0 replies, has 1 voice, and was last updated by yellowfin 4 years, 4 months ago. 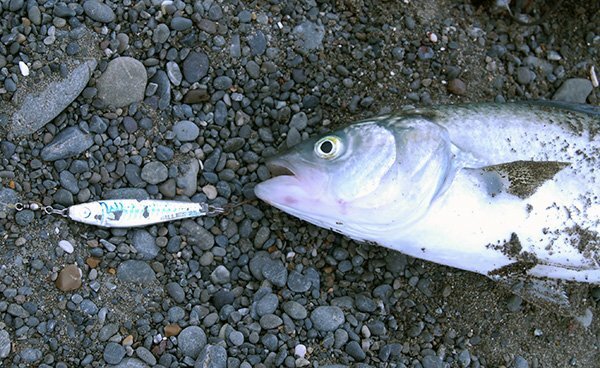 Sadly today I lost my last Gillies 25g kahawai lure. I have caught countless kahawai on that particular lure but finally lost it at the river mouth! I was fishing with light braid on my Shimano Aerocast 4010. Come to think of it I’ve had that braid for a while too. It is tremendous fun hooking kahawai on light gear with the big fish pulling off quite a bit of line, and jumping before being landed and released. The problem with old thin braid is that it frays. It also gets damaged from tangle-ups with other anglers lines. I’ve got some really thin diameter 30lb braid I might spool up with instead! Being old fashioned I’m still using a monofilament leader but see that a lot of guys are now just tying their lures straight onto their braid.